Manchester City recorded a 15th consecutive Premier League win with victory at Swansea, but Manchester United beat Bournemouth to keep within 11 points of the leaders. A David Silva double and goals from Kevin de Bruyne and Sergio Aguero gave Manchester City a 4-0 win at bottom club Swansea, as Pep Guardiola's side extended their record-breaking winning streak. 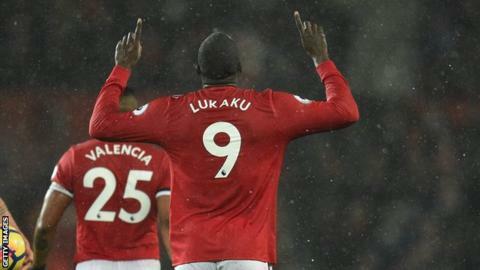 Manchester United recovered from Sunday's derby defeat by their title rivals with a 1-0 success over Bournemouth, Romelu Lukaku scoring only his second goal in his last 10 league games. How did Lawro get on with predictions against Shed Seven? Sam Allardyce continued his undefeated start as Everton manager with Wayne Rooney's tap-in enough to beat Newcastle, who sit a point above the relegation zone. And Leicester boss Claude Puel enjoyed a happy return to his former club Southampton as his side recorded a fourth successive league win with a resounding 4-1 victory at St Mary's. Tottenham beat Brighton 2-0 to move up to fourth, with Liverpool a point behind after being held 0-0 at Anfield by West Brom. West Ham remain in the relegation zone - level on points with 17th-placed Albion - despite a goalless draw against Arsenal, who are seventh.